Unlike other casino games, poker is a game of skill where participants are not actually playing against the house, but are competing against each other. Poker has acquired the status of what they call a “mind game” and rightfully so – some of the key skills experienced poker players possess include a good understanding of probabilities, discipline, patience, the ability to read others’ body language, and strategic play. Since poker is the most popular card game of all times, a number of variations have emerged throughout the years, with Texas Hold’em, Omaha Hold’em, Seven-Card Stud, and Five-Card Draw being the most widespread variants. Of course, this also means there are variations in the rules of play. However, there are some basic aspects that all variations of this game of skill share. If you are new to poker, we suggest you take a look at the following article to become better acquainted with the game’s basic rules, the most common betting structure, and the types of limits at poker tables. Most popular variations of poker typically utilize one standard deck containing all 52 cards. In most cases, the jokers are removed from the deck. In variations like Draw poker, the jokers remain in the deck to be used as additional Aces or to help players complete winning combinations such as the Flush or the Straight. Lowball poker variations also make use of the joker, which in such instances plays the role of the lowest possible card that does not pair the player’s hand. A standard 52-card deck can serve two to ten players, but there are instances where more players have participated in the game all at once. However, the number of players also depends on the poker variation. With games like the Seven-Card Stud and the Razz, where each participant is dealt seven cards, a 52-card deck can serve between two and eight players. If players deal the cards in the game, the deck needs to be shuffled and cut before the game starts. In some cases, the shuffle and cut involve two or even three people. The player, who has dealt on the previous hand, collects the “burnt” (discarded) cards and squares the deck before it is shuffled. Then, the player sitting to the left shuffles the deck and slides it to the new dealer. The player seated to the right of the new dealer is the one to cut the deck. The deck then needs to be riffled at least four times. A cut card or sometimes a joker is placed at the bottom of the deck so that nobody can see which the bottom card is. If there are any complaints regarding the shuffling or cutting of cards, these should be voiced before the players have taken a peek at the hands they have been dealt. In cash games, the objective of the players is to win as many chips as possible which is achieved by winning hands. Cards are ranked from the highest to the lowest as follows – A, K, Q, J, 10, 9, 8, 7, 6, 5, 4, 3, and 2. 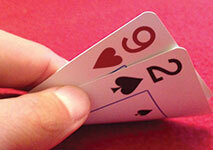 Depending on the poker variation, the Ace can sometimes be used as the lowest-ranking card. However, it can never be ranked as both low and high in one and the same hand. The four suits are considered to be of equal rank. If two players have the same hands that differ only in terms of suit, they will split the pot as one suit cannot beat another suit. The number of hole cards (the cards dealt facing down) each player receives at the start of a betting round differs from one poker variation to another. However, the hands players reveal at the final betting round or the Showdown, always consist of five cards. The game starts with each player making an initial bet which goes towards the pot. The players are then dealt their hole cards and take a peek at their starting hand by lifting the corner of the cards. In some variations of poker, a small plastic disk, called the “dealer button”, is placed in front of the player, who assumes the role of dealer. Note that the player who acts as the dealer does not necessarily deal the cards in the literal sense of the word. The dealer button is simply used to determine the order of action. At the end of each hand, the dealer button rotates among players in a clockwise fashion. The player, who has the dealer button also has a certain advantage over their opponents because they get to act last. Therefore, the “dealer” would have seen everyone else’s cards when they finally make a move. The first round of betting is the only exception to this rule. Once players have taken a peek at their starting hands, they can choose to check, raise their bets, call or match their opponents’ bets, or fold their hand, meaning that they relinquish their claim to the pot. Players, who have not folded during a betting round are often referred to as “active players”. In some variations, the betting round ends when all players have called or in other words, have contributed an equal amount of chips to the overall pot. In variations where community cards are used, the players are given the opportunity to improve their hands on following betting rounds by using some of the cards that have been dealt on the board. At the end of the last betting round, all players who have not folded reveal their hands. The person who shows the best five-card hand claims the pot. In poker, players often resort to bluffing or convincing their opponents they have a stronger hand than they actually do. This way, the opponents may choose to fold, which automatically would result in a win for the bluffer. At the start of the first betting round, players are required to make what is called a forced bet. These are mandatory wagers which also differ between poker variations. Some types of forced bets are obligatory for all players sitting at the table, others are made only by specific players, depending on where the dealer button is. The two most widespread forms of forced bets in poker are the ante and the blind. The ante is a forced bet which is made predominantly in variations of Stud and Draw poker. This obligatory bet is made by all players at the table prior to dealing any cards. In many cases, the ante amounts to a single betting unit which coincides with the table minimum. The ante often serves as an incentive for players to try and improve their hands rather than folding them. Even more so, considering the fact players who fold will automatically lose their forced bets. The ante is practically not counted as an actual bet – it is simply an entry fee all players must pay if they wish to partake in the game. This is to ensure a pot is accumulated before the cards have been dealt. The blinds are another popular form of forced bets. These are also made prior to the players receiving any cards, hence the name “blinds”. However, not all players at the table are obliged to make blind bets. In games like Omaha Hold’em there are two blinds – small and big. Who pays the blinds depends on where the dealer button is positioned. As the button rotates around the table, all participating players will have to pay blinds on subsequent betting rounds. Typically, the small blind is made by the player sitting immediately to the left of the dealer and amounts to a half of the big blind. Thus, if the big blind is $4, the small blind will be $2. This forced bet aims at encouraging action among the players. Unlike the ante, the blind is not an entry fee because it is counted as part of the bets the two players have made. If the players decide to fold, they will directly lose their blinds. Once players have been dealt their cards, they get to choose from five betting actions, namely calling, betting, raising, checking and folding. Read on to learn what each of the five betting actions entails. In order to remain in the game, players are required to match the bets of their opponents or in other words, they need to contribute to the pot with an amount of chips that equals that of the initial bettor. If several players have already placed their bets, the caller is expected to match the amount of the highest bet at the table in order to qualify for the next betting round. If the caller does not have a sufficient amount of chips on them to match the previous bets, they have the option to go all-in by calling only that portion of the pot they can actually afford to cover. Checking is yet another option for the player, in which case they choose to decline the opportunity to make a bet. However, this is an option only if other players have not placed any bets on the table for this betting round or if the player has already contributed to the pot with a forced bet. If bets have already been made, players will have to either call, raise or fold. If other participants have not placed any bets during the present betting round, the player can choose to bet or contribute with a given amount of chips to the pot. The player is said to be betting only if they are the first to place chips at the table. If someone else has already done so, the players can either call their bet or raise. However, the players who have already paid the small and big blinds are treated as if they have already placed their bets, which is why they have the option to call, raise, or fold only. As the term itself indicates, raising involves contributing to the pot with a greater amount of chips than what is necessary to cover the previous player’s bet. It is the betting structure of the particular game that determines by how much players can raise. Often there is a minimum amount by which players are allowed to raise at the table. The rule of thumb is that the raise should at least be equal to the amount of the previous bet or raise. In other words, the raiser is obliged to call the previous bet’s amount and make a bet that exceeds it. The other players can subsequently choose to either match the raise or re-raise themselves by betting a greater amount. When players fold, they practically give up on their hand when it is their turn to act, thus, relinquishing their claim to the pot. Players, who have folded their hands cannot win and are not allowed to place bets until the current hand is played to completion. Most often than not, players who fold simply return their cards to the dealer. What is more important, players who have folded are not given back the bets they have previously made. These remain in the pot for other players to win. Also, when a player folds a hand, they are recommended to do so without turning their cards face up. Revealing the cards of folded hands is deemed poor table etiquette because the remaining players are provided with additional information as to which cards are “dead” and which cards are still in play. Needless to say, this might affect how subsequent hands are played. It goes without saying the betting structure depends on the variation one is playing. In games like Texas Hold’em, where community cards are in play, the betting structure involves several betting rounds. It all begins with a given player being assigned the position of a button. Before any cards are actually dealt to anyone, the two players sitting to the left of the dealer button are typically required to pay the small and the big blinds. Sometimes an ante may be in place instead of the blinds. The dealer button rotates clockwise after each hand is played. Once the forced bets have been made, each participating player is dealt two cards face down. These are referred to as hole cards or pocket cards. After these have been dealt, the first betting round starts and all players take a peek at their cards to evaluate the strength of their hands. The first player to act is the one sitting immediately to the left of the big blind. Betting proceeds clockwise with each player choosing to fold, call, bet or raise. The second betting round is referred to as the Flop. Three community cards are placed face-up at the center of the table. The player positioned to the left side of the dealer button is the first one to act. If this player has previously folded, the right to act passes to the person next to them. Players are again required to choose between checking, betting, raising (if someone has already made a bet), calling or folding their hand. Once everyone has made their decisions, the third betting round, called the Turn, can commence. A fourth community card is flipped face-up at the table and is placed next to the Flop. Players again decide on their course of action by choosing one of the above-listed options. What follows next is called the River – a fifth community card being flipped facing up and placed next to the Turn. Sometimes, the fifth community card dealt on the table is referred to as the 5th Street. This is where the fourth and last betting round starts. Betting again moves clockwise and all players remaining in hand select one of the five betting actions. Once the fourth betting round is completed, the Showdown begins. Now that all five community cards are on the board, players can choose which ones to combine with their hole cards in order to improve their hand. In Texas Hold’em, players can choose to combine one of their hole cards with four of the community cards or two hole cards with three community cards. In comparison, the rules of Omaha Hold’em require players to combine precisely two of the four hole cards they are dealt with exactly three community cards. At this stage, everyone flips over their hole cards and the player with the highest-ranking hand at the table claims the pot. Betting limits may vary depending on the game’s betting structure. In popular poker variations such as Omaha Hold’em and Texas Hold’em, the most common betting limits include the pot limit and the fixed limit, but there are no-limit tables as well. The name pretty much indicates what this table limit is all about. At such tables, the bets players can make are limited to the size of the overall pot for the current betting round. If a given player has called on the previous bet, they are allowed a raise up to the pot’s amount. This may cause the pot to expand at a very rapid pace, forcing other players to go all-in in order to match previous bets. Fixed-limit tables are most common in home games or in casino cash games. In one such game, the players are expected to call, raise or bet by a fixed amount which is specified beforehand. In many cases, the size of the big blind determines the limit for the bets and the raises during the first two betting rounds. In the following betting rounds, the bet and raise limit is usually twice the size of the big blind. Players are always informed on the size of the big and the small blinds in advance. Thus, if the small blind is $1 and the big blind is $2, the fixed limits for the game will be $2/$4. As players are usually not allowed to raise more than three or four times per betting round, the maximum amount they can put in at one such table will be $8. Please note that if two players remain in hand while all the others have folded, they will be allowed to raise further. At no-limit tables, players are allowed to bet any amount they wish at any given moment and are practically limited only by the size of their bankrolls. The only requirement is that their bets should be at least equal in size to the big blind. Similarly, subsequent raises should equal or exceed the size of the last raise on the current betting round. No-limit tables predominate in tournament poker and are mostly considered a suitable option for professionals or players, who prefer more aggressive play. While there is no upper limit to how much you can bet, players are still required to cover the minimum bet limit at such tables. The term “dead hand” is used to refer to any hand in poker which has been compromised and therefore cannot be played. There are several different situations in which a player’s hand can be declared dead. For instance, if a given player faces a raise or a bet and attempts to fold their hand, it will be proclaimed dead. The same will happen if you throw your hand away with a forward motion and cause a fellow player to act behind you. Once a player folds a hand, it is automatically proclaimed dead. Sometimes, players are given a specific amount of time to make a decision and act. Failing to bet or raise within the specified time limit may also result in a dead hand. Additionally, players are prohibited from acting on a hand, in which the joker is one of their hole cards, i.e. if jokers are not implemented in this particular game. Last but not least, if your hand does not contain the necessary number of cards, it will not be considered valid. Sometimes, it is the actual dealer (the croupier, not the player with the dealer button), who makes a mistake. Provided that the mistake is serious enough to affect the game, the cards that have been dealt will be collected and the deck will be reshuffled for the next betting round. A misdeal can happen under different circumstances. For instance, a misdeal occurs when one or more hole cards have been accidentally exposed when dealt, causing some of the players to see them. Another example of a misdeal is when the dealer involuntarily deals the wrong number of hole cards to any given player at the table. However, if it is possible to correct this mistake without changing the card sequence, the hand may pass as valid. The wrong player holding the dealer button causing the cards to be dealt out of sequence is yet another example of a misdeal.